CE pending approval; choose from 400+ sessions and workshops. Keeping Health Care on Track is this year’s theme, and our goal is to help keep your career headed in the right direction, in the right lane and moving forward. Join us for more than 400 educational sessions and workshops, unparalleled networking opportunities and some good, NP fun including a welcome reception at the Indianapolis Zoo—an off-site event where you can mingle with colleagues while enjoying hors d’oeuvres and a cash bar against the backdrop of amusing monkey antics, roaring lions, giraffes and more. Start your engines and register now for the 2019 AANP National Conference this June in Indianapolis! Already registered? Here's what to do next. Why Attend AANP National Conference? Select from more than 400 sessions and hands-on workshops showcasing the diversity of the NP role. Earn up to 38 contact hours of continuing education (CE) credit pending approval by AANP (includes all sessions Tuesday through Sunday). Join discussions on current national, state and local legislative, regulatory and practice issues affecting NPs. Find opportunities for national and international collegial networking with thousands of NPs. 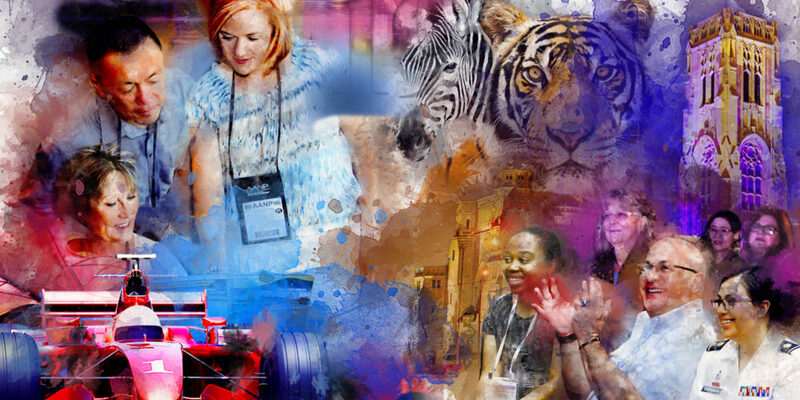 Experience Indy with the AANP Welcome Reception at the Indianapolis Zoo, an NP golf outing and tours of Indianapolis, including a bike tour, Indianapolis Speedway tour, wine and jazz tour and city sampler tour. Learn more about the 2019 AANP National Conference, and hear from AANP President Joyce Knestrick and Indianapolis Mayor Joe Hogsett, in the Registration Brochure! Provides expert faculty presentations of current, practical and clinically oriented evidence-based practice information that addresses the roles of all providers and patients, incorporating an interprofessional perspective over a broad range of therapeutic areas. Supports the discussion of current national, state and local legislative, regulatory and practice issues affecting NPs. Promotes national and international opportunities for collegial networking. The abduction of Elizabeth Smart was one of the most followed child abduction cases of our time. At the tender age of 14, just before celebrating her middle school graduation, Elizabeth went to sleep in her family home just as she had always done. Awakened hours later to a knife held roughly against her throat, she was taken from her home and family and held captive for nine long months. In her captivating message, Elizabeth shares her incredible story of perseverance in the face of unimaginable adversity. Her speech not only tells her personal story but also discusses topics such as overcoming extreme adversity, the importance and process of recovery and not allowing your past to dictate your life's future. Elizabeth knows that there is nothing more important than having hope in a difficult situation. Having lived through an extreme circumstance as a young teenager, Elizabeth gives great insight and hope to all. She has since gone on to become a child safety activist and skillful advocate for missing persons. Together with her father, Ed Smart, she urged lawmakers to support sexual predator legislation and the AMBER Alert system. In February 2014, Elizabeth testified before the Utah State House of Representatives in favor of House Bill 286, which created curricula for use in Utah schools to provide training on child sexual abuse prevention. In addition, she and other abduction survivors worked with the Department of Justice to create a survivors’ guide, “You're Not Alone: The Journey From Abduction to Empowerment,” meant to encourage children who have gone through similar experiences not to give up but to know that there is hope for a rewarding life. “My Story,” a memoir of Elizabeth’s experience written with Chris Stewart, was included on The New York Times Best Sellers list in 2013. The book details both the kidnapping and the formation of the Elizabeth Smart Foundation, which Elizabeth founded to promote awareness about abduction and end victimization through prevention, recovery and advocacy. Her follow-up memoir, “Where There’s Hope: Healing, Moving Forward and Never Giving Up,” explores what it takes to overcome trauma, find the strength to move on and reclaim one’s life. Elizabeth is an acclaimed speaker, as her story of recovery continues to motivate parents, law enforcement and leaders worldwide to focus on children’s safety. 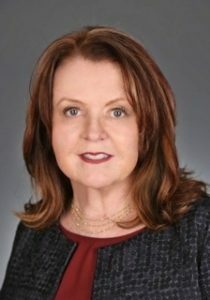 Dr. Margaret A. Fitzgerald is founder and president of Fitzgerald Health Education Associates (FHEA), a leading national provider of NP certification and NCLEX-RN preparation, as well as ongoing continuing education for health care providers. Her numerous contributions to the advancement of the nursing profession and practice through hundreds of publications, thousands of presentations, tenacious advocacy and dedicated mentorship for many well-known NP speakers and leaders has earned Dr. Fitzgerald many honors. Dr. Fitzgerald’s awards include the Dr. Loretta C. Ford Lifetime Achievement Award, the Sharp Cutting Edge Award, the National Organization of Nurse Practitioner Faculties (NONPF) Lifetime Achievement Award, The American Journal of Nursing Book of the Year Award and the Outstanding Nurse Award for Clinical Practice by the Merrimack Valley Area Health Education Center (AHEC). She has also been recognized as one of the 50 Leaders in 50 Years by the UMass Lowell Solomont School of Nursing, and she has been inducted as a Fellow of the American Association of Nurse Practitioners (FAANP), the American Academy of Nursing and the National Academies of Practice. Dr. Fitzgerald is an adjunct associate professor at Frances Payne Bolton (FPB) School of Nursing, Case Western Reserve University, in Cleveland, Ohio, where she earned her Doctor of Nursing Practice and received the FPB Alumni Association Award for Clinical Excellence, as well as the Distinguished Alumni Award. Dr. Fitzgerald practices at a federally qualified health center in Lawrence, Massachusetts, where, for more than three decades, she has been privileged to provide multigenerational family, primary and urgent care. Login with your aanp.org username and password and follow the simple online instructions. Complete the registration form and return it by mail or fax with all required information and payment. By submitting a registration form by mail or fax, you agree to AANP's conference terms and conditions. Did you know AANP members save enough on conference registration to more than fully pay for their membership dues? Become a member today and claim your national conference discount! *Please note, if you only register for a workshop on either Tuesday, June 18, or Sunday, June 23, you will also be charged a one-day registration fee. Be an AANP NP, Student, Post Master’s Student, Career Starter, Associate or Retired member and paid registrant attending the entire conference. Have a current, valid phone number and email address on file in your AANP account. Book for at least five nights between Monday, June 17, and Sunday, June 23, at one of the AANP housing block hotels. Please ensure you use the same name for conference registration and hotel reservations. Register for conference and complete your hotel reservation on or before Monday, March 11, 2019. Winners will be notified and announced in AANP communications no later than Friday, March 29, 2019. AANP is pleased to present more than 400 sessions, available Tuesday, June 18–Sunday, June 23. Sessions can be selected during the online registration process. This educational activity is pending approval by the American Association of Nurse Practitioners (AANP) of up to 38 contact hours of accredited education (includes one session per time slot Tuesday–Sunday). To better portray the beauty and diversity of the true NP community, AANP wants to continue increasing its use of real NPs on the association's website, in its marketing campaigns and in many other creative spaces. Volunteer a few minutes of your time in the photo shoot area on Tuesday, Wednesday or Thursday to help represent real NPs, or share your perspective in a brief video interview! The link to access presentation handouts will be emailed to all conference registrants by early June 2019. Registrants are encouraged to print the materials or store them on an electronic device prior to attending sessions. In addition, all handouts can be viewed using the AANP Conference App, available for both iOS and Android devices. “I always choose the AANP National Conference because of the plethora of topics that you can get your continuing education credits for. There's such a great variety every year." In addition to more than 400 CE sessions, the AANP National Conference also offers skill-enhancing workshops for hands-on learning opportunities and in-depth discussion on a variety of topics. Workshops are subject to an additional fee, as outlined in the Workshops tab. Workshop attendees must also register for the corresponding conference day(s). Visit the Exhibit Hall to see poster presentations featuring the latest evidence in the field. You can view the posters any time the Exhibit Hall is open. A detailed schedule with information on attended poster presentations will be available on site in the 2019 AANP National Conference Guide. Industry scientific poster submissions closed on March 4 at 5 p.m. CT.
Thursday, June 20: 3:00 p.m.–4:45 p.m.
Friday, June 21: 1:30 p.m.–3:15 p.m.
Saturday, June 22: 10:30 a.m.–11:45 a.m. The cost of industry supported and sponsored (IS) events with food service presented at the AANP National Conference is not included in the conference registration fees. These limited CE symposia and non-CE product theaters are funded entirely by the supporting or sponsoring company, allowing AANP to offer some conference registrants complimentary access to a limited number of CE and non-CE educational presentations. Due to their educational focus and guideline requirements, attendance is restricted to only conference registrants. To expedite processing attendees into these events, registration will occur on site at the entrance of each scheduled event on a first-come, first-served basis. There is no pre-registration. SPGs are communities within AANP that share common goals in advancing knowledge and professional development in select areas and meet regularly at conference. AANP continues to expand SPG opportunities and is pleased to offer five new sessions at this conference. SPG membership is only $20 each annually. The AANP Plaza is your one-stop shop for AANP departments and associated organizations, helping you stay involved in your NP organization. The AANP Career Fair allows you to meet directly with employers from around the country who are searching for NPs in various specialties. Booths from a number of health care organizations and health tech companies help you to explore new products and trends in health care. Industry Scientific Poster Presentations and Product Showcase Theaters keep you up to date on new research and approaches for your patients. In addition to more than 400 CE sessions, the AANP National Conference also offers optional skill-enhancing workshops for hands-on learning opportunities and in-depth discussion on a variety of topics. Workshops are subject to an additional fee, as indicated below. Workshop attendees must also register for the corresponding conference day(s). *The Fundamental Critical Care Support (FCCS) Course offers both classroom and hands-on interactive instruction over a three-day period. Registrants will receive a completion certification upon successfully passing the post-test. There will be two groups offered at the 2019 AANP National Conference. The following is a broad glance at the conference week schedule. Your personal session selections (to fill in the Concurrent Presentations time blocks) can be added during the online registration process. Unopposed Time: 2:30 p.m.–4:45 p.m.
Unopposed Time: 1:30 p.m.–3:15 p.m.
Unopposed Time: 10:30 a.m.–11:45 a.m. The 2019 AANP National Conference housing offers a wide selection of hotels near the convention center and throughout Indianapolis, with discounted pricing for those staying within the AANP housing block. Special conference rates, ranging from $159 to $205 (single/double) plus taxes and fees per night, will be honored for conference registrants and their families for reservations covering lodging between Sunday, June 16, and Monday, June 24, based on availability. Make plans to arrive early or stay after to enjoy all that Indianapolis and the surrounding area has to offer. All reservations must be made by Tuesday, May 21, or until the block is sold out, whichever comes first. The AANP Housing Center is available to answer questions from 8:30 a.m. to 4:30 p.m. ET, Monday through Friday, excluding holidays. Let's Have Some Good NP Fun! Known as simply “Indy,” this is a city recognized for fast cars and blockbuster events. In recent years, Indy has also gained acclaim for a flourishing culinary and brewing scene, electric sporting events, thriving cultural institutions and award-winning family attractions. AANP invites you to enjoy the legendary hospitality of Indy, the crossroads of America. This year, AANP is excited to host the Welcome Reception at the beautiful Indianapolis Zoo on Tuesday, June 18, from 6 p.m. to 8 p.m. This one-of-a-kind event is free for all conference attendees. Attendees can dine at food stations or purchase drinks at cash bars throughout the zoo while exploring diverse environments and botanical gardens. Meet fellow NPs with savannahs, rainforests, oceans and other settings as your backdrop—all with more than 2,000 species of plants and animals to discover! Less than a 10-minute walk from the Indiana Convention Center (ICC), the Welcome Reception is completely free for conference attendees. Friends and family are welcome at an additional cost of $25 per person, with free admission for children under two years of age (purchase extra tickets). Limited transportation will also be available from key stops along the AANP housing block. Lovers of the putting green: Be sure to bring your clubs to conference this year! AANP’s inaugural Golf Outing will take place Tuesday, June 18, at the Brickyard Crossing Golf Course located at the Indianapolis Motor Speedway. For just $215 per person, the Golf Outing includes tee times, one cart for every two players and transportation between the convention center and golf course. Space is limited to the first 80 registrants, so don’t wait! Call 607-674-2668 or email golf@aanp.org to reserve your spot or organize a foursome. Get to know Indy by experiencing all the city has to offer with fellow NPs and conference attendees. AANP invites you, your friends and your family to join these outings in and around the city! Checkered Flag Adventure (Monday, June 17): Tour the famous Indianapolis Motor Speedway, including the Hall of Fame Museum—a must for racing fans or history buffs! Indy City Sampler (Tuesday, June 18): Experience the history, development, cultural heritage, ambiance and growth of Indy through this informative and fun sightseeing tour. Wine and All That Jazz (Thursday, June 20): Take a cellar tour of the Chateau Thomas Winery—complete with a wine tasting, of course—before relaxing to some cool jazz and a decadent meal. Pedal Your Way Through Indy (Friday, June 21): Indy's premier bicycle tour will let you experience places and spaces throughout the city that you just can't appreciate any other way—complete with a few surprises! 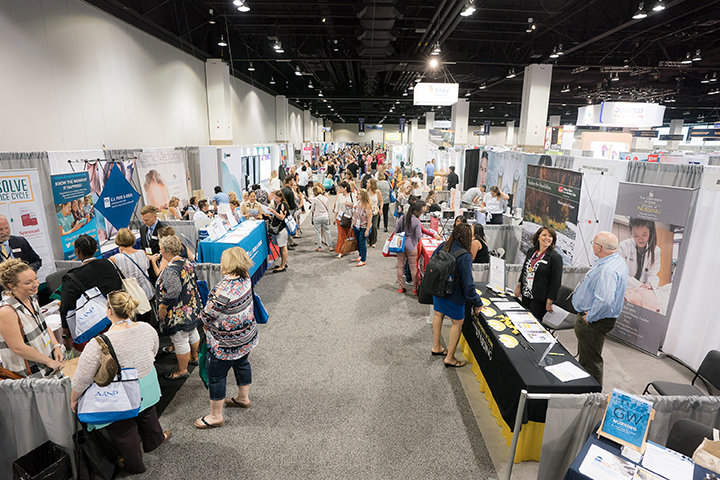 Attendees of the 2019 AANP National Conference attendees will have the opportunity in June to once again support Dress for Success. Your new or gently worn clothing items will be collected at conference, displayed in a boutique setting in the exhibit hall and then given to Dress for Success Indianapolis to provide women in the community with a helping hand as they return to or enter the workforce for the first time. It is the mission of Dress for Success to empower women to achieve economic independence by providing a network of support, professional attire and the development tools to help women thrive in work and in life. Think about what you would wear to a job interview. That is exactly the type of clothing Dress for Success needs. Your fabulous suits and other professional apparel could provide another woman with the confidence to enter or return to the workplace, make a great first impression and land a job that could change her life. Only women’s clothing and items are accepted. Many of the Dress for Success clients go directly to an interview, so please ensure that all items donated are on hangers, freshly dry cleaned or laundered, not more than five years old and suitable for wearing to job interviews. Thank you for participating in this most worthwhile endeavor. If you're wondering how to go about taking the time off work and dealing with the cost of travel and housing, this justification toolkit provides some tips and sample documents that can help you make your case to your employer. From the return your employer will get by investing in your attendance to skills and hands-on training you'll gain, this toolkit can help you explain the value of the 2019 AANP National Conference. The AANP Conference App is the best way to have the full conference schedule, your personal schedule of sessions, speaker details, materials, events, information and so much more right at your fingertips. If you have automatic updates enabled on your mobile device, the 2018 version of the app will become the 2019 version as soon as it's released. Following AANP on social media is a great way to connect with other NPs and industry professionals, to stay current with the latest health care news and to receive conference announcements. We want to hear from you, so connect today! Use #AANP19 whenever you're talking about conference! AANP reserves the right to change information in this webpage without advance notice. Cancellation requests require written notification to AANP at confcancellation@aanp.org and must be received by 11:59 p.m. CT on Monday, May 6. If received by May 6, a refund will be issued minus a $75 administrative fee or a $50 administrative fee for student registrations (entry-level student members only). After Monday, May 6, no refund will be granted. If you do not cancel in writing by Monday, May 6, and do not attend, no refund will be granted. If you cancel your conference registration, remember to cancel your housing reservation within the AANP housing block. AANP has the right to remove any housing reservations that are not supported by a conference registration. Policies are hotel specific. Please review the AANP housing block website for policies specific to deposits, early departure fees and cancellations. To provide a safe and healthy environment, the ICC is a non-smoking facility. All interior areas are designated as non-smoking areas. The ICC complies with the requirements specified by the Americans With Disabilities Act (ADA). AANP is responsible for all non-permanent accessibility requirements. If you have any questions or require special accommodations or auxiliary aid relating to a disability for your conference attendance, please notify AANP at conference@aanp.org or 512-442-4262 no later than Monday, May 13. Live animals are prohibited within the ICC other than animal(s) that serve a guide or service function as defined by ADA. The ADA defines service animals as dogs that are individually trained to do work or perform tasks for people with disabilities. Firearms and weapons are prohibited on the convention center premises. Registered Attendees: Registered attendees must wear their official conference name badge at all times to access conference events. There will be a $25 fee to reprint a lost badge. Guests of Registered Attendees: Guest badges may be purchased for $50 each for persons aged 16 and older. This guest badge allows entrance into the Exhibit Hall only. Children, including infants, under the age of 16 are not allowed in conference sessions or the Exhibit Hall due to safety concerns, audio recording and maintaining an appropriate learning environment. Attire is business casual. The ICC strives to keep rooms at a comfortable temperature, but layered clothing is strongly suggested. Comfortable shoes are highly recommended. Sitting in chairs is required in classrooms for the majority of presentations due to Fire Marshal regulations. Sitting on floors is not permitted. Standing is very limited and not allowed unless there is a hands-on or networking portion of the session, or you have a medical or health condition. Please kindly inform the classroom assistant(s) if you have a medical or health condition and need to stand during part of a session. In the event AANP should find it necessary to cancel or postpone the 2019 AANP National Conference for any reason, including but not limited to low registration, strikes, acts of nature, war, terrorist acts or other circumstances beyond AANP’s control, AANP’s liability shall be limited to refund of registration fees paid to AANP. AANP appreciates your dedication in planning and providing advisement on this conference schedule. Receipts, notifications and updates from AANP are communicated by email. Please verify aanp@aanp.org is in your email address book so you never miss an important announcement. If you currently are not receiving communications from AANP, contact conference@aanp.org. The American Association of Nurse Practitioners (AANP), the national organization representing the interests of more than 270,000 NPs, invites you to attend the 2019 AANP National Conference! Don’t miss the opportunity to get in front of this growing, influential, professional group of health care providers.